If you’re looking for a fun and exciting way to get away from it all and spend some quality time with your loved ones, there’s no better solution than a road trip. It gives you the opportunity to see new places, discover unique attractions you wouldn’t normally find, and create memories that will last a lifetime. A New Mexico road trip is an excellent option for seeing all the awe-inspiring cities and sites that the Land of Enchantment has to offer. To help you get started with your planning, here are some of our favorite New Mexico road trip attractions that you certainly won’t want to miss. Interested in even more ideas for your New Mexico road trip? Then you won’t want to be without our free Vacation Guide! This handy vacation planning tool is the only thing you’ll need to find all of our area’s top activities and attractions including nearby hiking trails, restaurants, entertainment, annual events, and more. Request your free copy today and let’s start planning your dream New Mexico getaway. 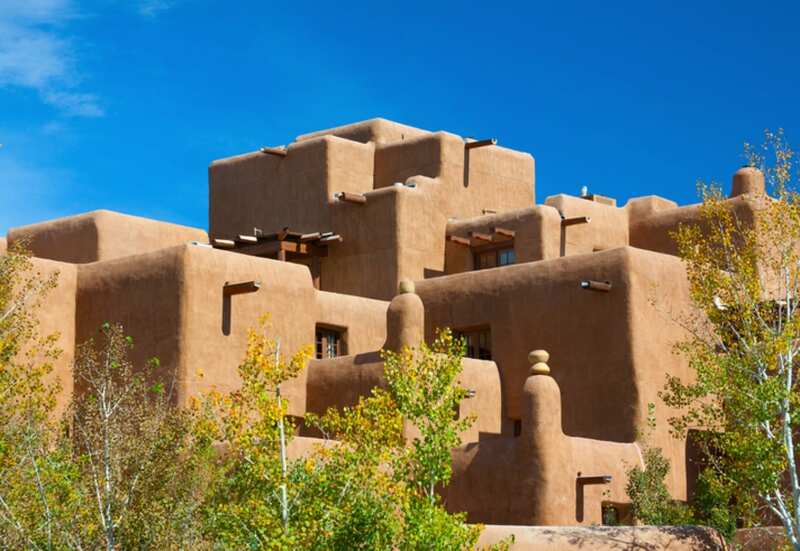 With Pueblo-style architecture, rich history, and a thriving arts community, Santa Fe is a destination unlike any other. You could spend an entire day in this city exploring your favorite art gallery, dining in one of the many award-winning restaurants, or shopping for souvenirs along the popular Canyon Road. Santa Fe is also home to some of the nation’s best hiking trails, so don’t forget your walking shoes! No matter how you decide to spend your day in Santa Fe, boredom is never an option. The Turquoise Trail Scenic Byway is a 50-mile road that encompasses 15,000 square miles in the heart of central New Mexico. Not only does it pass through major cities like Albuquerque and Santa Fe, but it also includes interesting things to see and do along the way. During your trip down the Turquoise Trail, be sure to make stops at small towns like Sandia Park or Madrid for lesser-known recreational opportunities, art, theater, and more. This UNESCO World Heritage Site is a Pueblo village that has been consistently inhabited for over 1,000 years! Traditional Native Americans and their families still live in the village. Of course, you are welcome to visit and tour the premises. Experiencing the way of life of the Red Willow people in-person is a memory you will always remember, and the two-story village architecture is just as memorable. You won’t want to miss the religious feast days in which dances and tribal rituals are conducted. You will be welcomed as an honored guest as they entertain you with riveting drum music and spiritual chanting. Before you visit, make sure to call ahead as the site could be closed for religious holidays or a death in the village. The Bandelier Cliff Dwellings are one of the Southwest’s most intriguing national monuments and for good reason! This historic area contains 11,000-year-old artifacts over 33,000 acres of canyon and mesa country. From 1150 CE to 1550 CE, the ancestral Pueblo people lived here by carving their homes into the volcanic rock. They also planted a plethora of crops including corn, beans, and squash. Although the Pueblos moved on to more fertile land thousands of years ago, evidence of their daily life still exists today. During your visit to the monument, you’ll be able to see a wide variety of interesting artifacts including petroglyphs, painted caves, standing masonry walls, and more. Also known as Kasha-Katuwe Tent Rocks, this awe-inspiring attraction is an outdoor wonderland just begging to be explored. The massive cone-shaped rock formations were created by volcanic eruptions nearly seven million years ago! The park offers several hiking trails that provide fantastic views of the rocks and other spots for birdwatching, geological observation, and plant identification. Volcanic aquifers containing healing mineral waters can be found deep in the ground in New Mexico. As a result, several natural hot springs have formed all over the state and are ideal for a quick and rejuvenating soak. Jemez Springs, NM boasts a variety of hot springs surrounded by New Mexico’s beautiful scenery. You may also want to spend time at the Ojo Caliente Mineral Springs in Santa Fe, a natural health resort with over 11 different pools to choose from. Resembling waves on a blank canvas sea, White Sands National Monument is one of the world’s greatest natural wonders. These white dunes of gypsum sand roll across 275-square miles of desert, preserving a major portion of dune field and local wildlife. When you and your family visit, you’ll be able to enjoy a wide variety of activities including hiking, bicycling, ranger programs, picnicking, and driving through the dunes. The most popular activity at the park, however, is sledding down the slip face of the dunes! It’s an exciting and heart-pumping adventure that won’t soon be forgotten. Located just 35 minutes north of Santa Fe, our charming and historic village is a must-see during your New Mexico road trip! Founded in the 17th-century by Spanish settlers, Chimayo is a colorful and inviting town nestled in the northern New Mexico mountains. As you wander through the village and chat with the locals, you’ll discover that many of the people that still reside in this town are descendants of the land’s original settlers. They carry on the traditions of their ancestors that put Chimayo on the map including blanket weaving, tending to fruit orchards, producing red and green chile, and raising cattle. This is also the site of the famed El Santuario de Chimayo, a small Catholic church that serves as the final destination for a major pilgrimage that takes place each year during the Holy Weekend. Don’t forget to check out the fascinating Chimayo Museum and the popular Rancho de Chimayo restaurant! With so much to see and experience on a New Mexico road trip, it’s impossible to see it all in one day! We invite you to unwind and rejuvenate with us at our quaint bed & breakfast in Chimayo, NM. With an authentic Southwestern atmosphere and ideal location, we are one of the most exalted bed & breakfasts in our area. Our charming inn suites accommodate guests for short term and long term stays and provide many of today’s modern comforts. While you’re relaxing in your room, you and your family will enjoy a variety of unique amenities including kiva fireplaces, private decks that promote views of the Sangre de Cristo mountains, and beautiful antique decorations. Plus, breakfast is included and features various American and New Mexican selections that will prepare you for a full day of adventures.